Lughnasadh (LOO-na-saa) is a cross-quarter festival which roughly falls halfway between the summer solstice (Litha) and the autumn equinox (Mabon). The agricultural year changes from growing to harvesting, and the balance between night and day shifts more noticeably. It marks the time of year when the first grains and fruits are harvested, therefore it is sometimes called ‘First Fruits’. The name Lughnasadh is thought to have its origins with the Celtic craftsman god Lugh as a funeral feast and sport competition in honour of his foster mother, Tailtiu, who died of exhaustion after clearing the fields of Ireland for agriculture. Lúnasa is also the name for the month of August in modern Irish, or Lùnastal in Scottish Gaelic. This day is referred to as Brón Trogaill in ancient Irish texts, marking the beginning of autumn. Some celebrate this festival as Lammas (‘Loaf Mass’), an early Christian feast day honouring the grain harvest. Various mythos surround this festival. In Wicca, it is thought that the Sun God ages and loses his strength as the sun rises farther in the south each day and the nights grow longer. 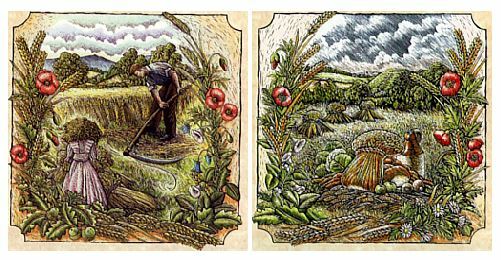 It marks the time when the first grains are ‘sacrificed’ to ensure the continuation of the harvest cycle, therefore highlighting the link between life and death. As the first grains are harvested at this time, wheat, barley, corn, bread, whiskey and beer are significant. Traditionally, bonfires were lit, with the ashes of previous bonfires scatted over the fields in order to bless the fields, cattle and people. 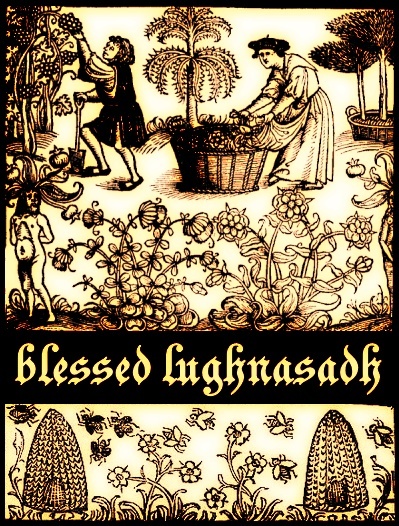 Lughnasadh was also an important time for handfastings, second to Beltane. Trial marriages in old Ireland would last a year and a day, with the option of ending the contract before the year was out. Lughnasadh can be thought of as a time of personal reflection of our actions and deeds, and our gains and losses over the past year. It is a time when we start to reap what we started sowing in spring. This requires introspection and honesty as we look inside to examine our thoughts, feelings and decisions. We can identify events which turned out poorly and look for their lessons, as well as acknowledge successes and consider how to carry them forward. We can take the opportunity to clear away unnecessary things to make our own harvest more bountiful.